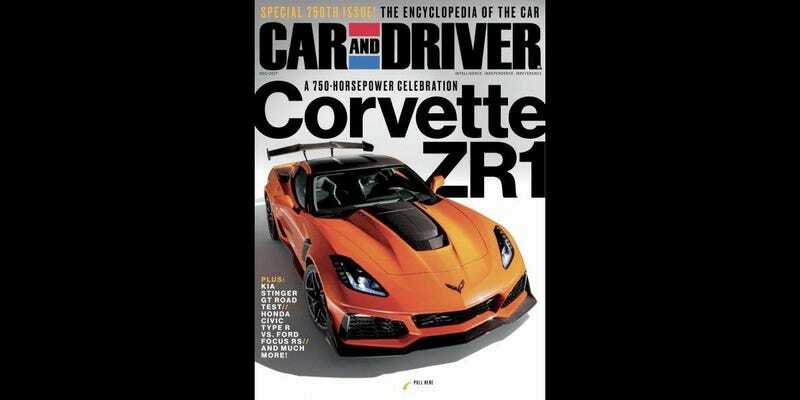 I’m not sure if this “leak” was meant to happen or not, but the cover for the December 2017 issue of Car and Driver is making the rounds on the internet, and with it comes our first official look at the new Corvette ZR1. And the power rating. It’s 750 horsepower now. So, uh, a lot. Update: More details on the car below. The most noticeable differences we can spot from this and the formerly top-tier Z06 are a different front bumper, a far more aggressive-looking hood, what appear to be racing bucket seats, and that wild spoiler out back. The magazine itself has predicted the ZR1 has the same supercharged 6.2-liter V8 as the Z06, but with larger intercoolers and better cooling. That’s good because the C7 Z06 was kind of infamous for problems in that department. The ZR1 name has been used to denote the King of the Hill Corvette off and on for some years now, including the high-tech C4 ZR-1 with a DOHC Mercury Marine-built V8 engine in the 1990s and the beastly supercharged C6 ZR1 from a few years ago. This new car has well over 100 HP on that car, so expect it to be an absolute demon. And considerably lighter than an actual Demon. Expect to see this thing at the 2018 Detroit Auto Show in January, if not sooner. Update: Actually, a report from Corvette Blogger says the car will debut in Dubai on Saturday, followed by the LA Auto Show later this month. So we’ll see! The ZR1 is essentially “a Z06 with more,” meaning it doesn’t get anything too radical like an all-new engine. They even have the same gear ratios and both can be had with either a seven-speed manual or eight-speed automatic. Still, the engine has a new designation: LT5, like the C4 ZR-1 had. It’s got a bigger supercharger than the Z06's LT4, and torque is rated at 680 lb-ft. Other differences: larger throttle body, different fuel injection system, strengthened crankshaft. Aside from the rear wing, everything from the A-pillar back is Z06, in terms of the body. It’s heavier than a Z06 too to the tune of about 140 pounds. The suspension setups are the same, just with different tuning. No new parts here. The ZR1's front wheels are half an inch wider, but both standard and optional tires are the same as the Z06; the ZR1 gets the Z06's optional brake rotors and calipers too, with new pads. It shoots flames from its exhaust. Which is good. Not enough cars do that from the factory.